Wow - thanks Kathleen. My poor neck is straining to hold up my swollen head! Recipients are to pass on the award to eight other bloggers. This is a challenge since according to Bloglines, I follow exactly 36 blogs and that includes I Can Haz Cheezburger? I love the sentiment of this award since I think it exemplifies the qualities of bloggers that I enjoy and value. Some of my blog friends are people I have met, so in the nature of the proximity basis of this award, I will chose blog friends whom I have not met but whom I have come to know and value: Tina, Jodi, Sylvia, Michelle, Valerie, Robin, Marie, and Leigh. I am really nervous about moths. I've been checking my studio, and just when I thought I'd gotten them licked, I found a basket today that I thought was wool in a plastic bag, but under it was unprotected wool with active moths. The basket and everything went into the trash. I was pleased to be able to recover this Icelandic yarn from a plastic storage bin that I had sequestered last year. I reskeined, washed and reballed everything. Other than the smell of mothballs when I washed the skeins and a few breaks, I am relieved that this yarn has been retrieved. I'm not sure if it was the sounds of spring through the open window, or the feelings of getting on top of the moths, but I decided a cleaning of my studio was long overdue. Also, I was having to step over and around piles in order to get anything done. rassed at how much I collected. I got really dirty and yet there's plenty of surface cleaning that needs to be done and will just have to wait. At least I feel like I can work in it again. I got a warp wound and ready to thread. It was so pleasant to wind with the window open, and the birds heartily singing in the trees outside. Yesterday, I chose the right day to spend on the deck, because today the wind has blown hard to bring in the new storm system - a warm and windy day. esting that twill just wants to hang nice and tabby, as cool as it looks, is bunchy. It was so pretty today that I decided to spend the afternoon on the deck and finish spinning up this roving. It would have been the perfect opportunity to wind a new warp, but it's been so cold and gray, I just couldn't make me stay inside. The bobbins didn't end up exactly even and I had expected a little more display of color from the lighter roving since they are both from the same dyes. Plied up, the yarn takes on a pastel quality. It may look a little different after its fulled, but I doubt it. I'll do that tomorrow morning so I can wind the balls in the afternoon. I'd really like to get this into the mail to DSD Shazzy Monday or Tuesday morning so I get back to spinning for natural dyes. I am viewing this project as an interlude. There wasn't a cloud in the sky. These aren't clouds, they're jet contrails and because it was so clear and still up there, they took a long time to dissipate. It was only in the mid 50s this afternoon but in the absence of wind, it was quite comfortable on the deck. A day like this makes me aware of just how much air traffic crosses over us. I am curious if all of these are going to or coming from Reno. Our foster dog Sammy has left a present for Charlie in his scratching box. Charlie is still having a hard time accepting the new, self-adopted and mostly full-time family member. I think Sammy senses Charlie's feelings and is trying to make amends. The gift has not been graciously accepted and is, in fact, being treated with a large degree of skepticism. Okay, the claws are out and if you could follow the path of Charlie's eyes, you'd know exactly where Sammy is. Alien creature, come get your stinkin' rope. Okay, okay - I get it, says Sammy. You don't want my toy, I'll take my toy, but you'll be sorry. It's a good toy. You're missing out here. The two bags on the left were trip knitting. Because I did so much driving this vacation, I didn't knit nearly as much as I had anticipated. I finished the right bag after we got home. I also knitted a little on a new Sonnet sweater. Here they are, stuffed with books to make them square and drying in the sun. It was the first day of spring and it was nice have the weather seem spring-like. It didn't last. If you've missed me saying it before, put the things you want to felt in the washing machine inside a zippered pillow case. This stuff would have gone into the pump. Instead it went into the bags. This lesson wasn't learned by me, but by Sara and I'm a good student. The left bag is natural colored Icelandic wood, the center is stuff that I found and should have lost, the right back is natural dyed Border Leicester wool. I'm out of yarn now. Well, except for this and I'm not sure the robin's egg blue of these indigos and the red of chochineal have the potential to work up into anything. I guess I made that gummy-bear colored bag, I suppose I could give this a go. We'll see. I guess it needs to be something. cular and I spent the entire day on the deck. I read, knitted, and yes, I even took my wheel out and spun for a while with my faithful companions. Best friends. While short on precipitation, this has been a consistently cold, grey and wearying winter. I went for a walk with my best friends. There's still snow on the Sierras, and in fact, the weather is supposed to turn tomorrow to bring us more snow on Sunday. Today was a gift. I got a generic email on Wednesday, addressing all of the county employees who had applied for cost-savings incentives. It directed me to contact the public employees retirement system - I have been approved for my early retirement buyout. This means I won't have to drive to work in the snow any more. People are asking me - what will you do when you're retired? I'm still thinking about it, but not driving in the snow is really high on my list. ture was in the low 60s, not especially warm, so when one cloud stepped in front of my heater, I as suddenly chilled. I ran inside for my camera and caught this image. One little cloud, and then it moved on. I was again feeling comfortable. I freshened the catnip in Charlie's scratcher. He looks a little drunk, doesn't he. I just finished this book today. Valerie told me about it three months ago and I've been on hold for it at the library ever since. I picked it up on Thursday and ended up being under the weather, so I wasn't able to read it as much as I wanted, i.e., I fell asleep. I am a pathetically slow reader and I could not put this down, provided I was awake, of course. This book is absolutely brilliant suspense. I am putting it in my Amazon basket (for Ian), along with it's sequel which is coming later this summer. It's part of a trilogy and all three are published posthumously. There's interesting information about him on the Wiki. I find more and more than I enjoy foreign authors. I was reading my book while eating lunch at the China Diner today. My fortune said, "Read a novel - and learn more about life." Hmmmmm. Another book that I loved was Shadow of the Wind by Carlos Luis Zafon. I read it, then listened to it in the car and loved it just as much. His book was translated from Spanish and he also has another book being released this summer. It's going into my Amazon basket as well. I would love suggestions from suspense lovers, mysteries excluded. Sadly, I'm allergic to them. esting, but Mim and are talking about a dye day later this Spring with natural dyes, and as they say in the South, I'm fixin' to get ready. The white is Bluefaced Leicester and will be hats. The grey is Lincoln/ Corriedale - odd cross breed I'm thinking. I absolutely love the sheen of luster-longwools, hence the name. I'll spin a little more of this, then switch to some white Lincoln roving that I had processed last year. The luster longwools are for bags. I really like they way they felt, or don't felt, and as Mim insists I acknowledge, I'm not felting at all - I'm fulling. Guess who is a felter. Since she's a whiz at it, I think she's entitled to take exception. 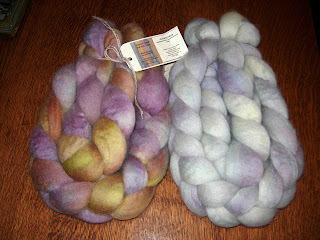 Speaking of Mim, I bought these two rovings from her this weekend, 4 ounces of Bluefaced Leiceseter at ten bucks each. I think that's the deal of the year, and if you're interested, she's got more just like it at her Etsy store, linked on her blog. I bought them for Shazzy. As a nonegenarian, Mother taught SD Sharon to knit. She has stayed with it and her skills have improved to the point that she is one of the knitting instructors at the Waldorf school our grandson attends. Last week Shazzy asked me again, "When am I going to get some of your handspun yarn?" I've put it off too long so this is it. I'll ply these two together to get 8 ounces of yarn. That's not much yardage, but maybe she can knit something for Noah? Now I just need to spin it. I am blog remiss. The blogs that I've put in my Blogger follow list don't seem to always show up in as blogs that I follow. 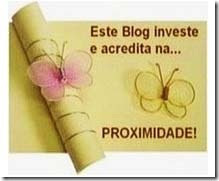 I have gone back to reading blogs through Bloglines because I know that everyone is actually there. I don't know what's up with Blogger. They've been naughty. I've been acknowledged with any award - thank you very much! I need to identify five addictions and tag five others to do the same. And I'm tagging: Becky, Kathy, Tina, Mim (a reason to blog) and Steph. We drove all day, from Redlands, California to Redding, California to see these two give themselves to each other in holy matrimony. I have a jillion pictures and as many memories, but in short - I am thrilled with my SD Margi's new husband, Paul. Grandma and Grandpa Campbell celebrate with a round on the dance floor. I will spare you - I have over 500 photos. Ah, the new horizons and dilemmas of digital photography. Granddaughter Alexia decided that her new cousin Elise must be a princess because she wore a beautiful dress and tiara during the wedding. She followed Elise everywhere, like an adoring puppy. The princess has changed from her wedding clothes, lost her tiara and glass slippers and still Alexia is her adoring fan. How simple are the illusions of the young, unjaded eye. After the wedding, 18 of us stayed at the Shasta Lake House at the north end of Shasta Lake. It was a bit of a squeeze and involved a pre-wedding meal at the Basshole Bar and Restaurant, mostly bar. Bad food, bad service, almost made us late for the wedding and we'll never forget it. It was the restaurant name that made everyone want to eat there. Now we say we got bassholed. This is the only picture I have of that experience. I thought it an odd way to deal with electrical wiring, but more odd is that I have no other pictures. I was tired. We had a wonderful time, playing dice, ping-pong and pool in the game room and otherwise, just sharing and being family. My book group met to discuss Jane Austen's Persuasion Tuesday night. Tuesday was my first day back to work after vacation. I hadn't finished the book until that morning and was convinced on my commute that we'd be done in ten minutes. After all, what was there to discuss. During the day I was able to read some background materials and came away with an appreciation for Austen's ability to deliver a window into the culture and mores of that time. Where I had loved Pride and Prejudice, I found this book a slog, but then it's probably not good vacation reading. The group loved it and appreciated how Austen showed us the decline of the landed gentry and the new fortunes and prospects of moneyed military, returning after the war of 1812. "To the Manor Born" was fading as quickly as their money, along with its vanity. The circumstances that set the stage are because Sir Walter Elliot, baronet of Kellynch Hall, has been unable to curb his spending and can no longer live within his means which necessitates a change in living arrangements. "Vanity was the beginning and the end of Sir Walter Elliot's character; vanity of person and of situation." What descriptive writing! No wonder whole courses are offered on just Jane Austen. One of our group commented that it took five lines of dialogue to say one simple thing - "Why didn't they just say what they mean?" she asked. To my surprise, I ended up enjoying the book, after the fact. How do animals know that you're going to be taking a trip? That's Solly's sweater there and I am frantically trying to get it finished. We are days from leaving and I'm feeling the pressure. Sammy is feeling the pressure too and she's milking it. And this is Solomon, in the arms of his adoring Uncle Doug, actually his cousin once removed. This great big cop loves his little itty bitty premature cousin, Ian's grand-godson. I knit the sweater for a 6 month size and it's huge. Did mention that the sweater is huge? As Michelle holds it open, I realize just how long the arms are and I am chagrined. Baby's little arms only reach to the top of their heads. This is a disaster. It looked good until I washed it and then it just relaxed into another, bigger size. You know what this means don't you. I didn't wash my swatch. I emailed Michelle and asked her send it with her MIL to the wedding and I'd fix it and send it back, but her MIL didn't make it to the wedding after all. I emailed her and said - either throw it through a drier cycle or send it to me so I can shorten those sleeves. I'm really sad - it could have been a cute sweater. niece was born in September but we didn't get to meet her until this trip. All the babies in our family are adorable, did I mention that? We call Ian "the closer" because he can put any fussy baby to sleep. This is McKay, our new grand-niece. She looks just like her mommy and isn't quite big enough yet for her sweater. She also was no match for her grand-uncle who was able to lull her to sleep in a record five minutes. I love this picture enough that I will probably have to print and frame it. McKay has just fallen to sleep in the arms of her great-grandmother. This octogenarian woman gave Ian a perfect hair cut, and when we walked over to her place to say goodbye the day we were leaving, had her sewing machine out and was working on a quilt. i want to grow up to be just like her. Our weather was charmed the entire ten days. I never have had such great atmospheric luck before. Yesterday we stopped south of Susanville to trade drivers so that I could drive on home and Ian would walk down with the dogs from the gate. I was flying on dry roads with the only snow on the mountains. We woke to a blanket of snow and since it never got above freezing today, we said goodnight to the same blanket of snow. Charmed. I tell you, we were charmed. Thanks for all your well wishes for our vacation. Our time at the beach was way too short and way wonderful. While those black spots in the waves are surfers, the dolphins also move just outside the shore break and are breath taking to watch. Sometimes I'd have to do a double take, because I wasn't sure which was which. As all good things come to an end, we closed up the beach house and returned to Neil and Rochelle's house in Redlands. I look at these pictures in amazement since we are now home and there's snow outside. I'll post later about the babies and the sweaters I knit for them. ripened oranges. I grew up with them, but had forgotten just how delicious they are. That is the jacuzzi hot tub. Rochelle had told Ian that we needed to bring swim suits. He didn't mention it and I didn't think of it. There is snow here, for crying out loud. Her other SIL has left an emergency suit so I was able to go in, not once, but twice. Wickedly wonderful. Ian gave both of us the same book for Christmas and the fun of it was that were both at the same spot. I had sunscreen on my face and the rest of me was covered. I forgot about my feet and I sunburned them. They really look weird now. Rochelle sent home this cat scratcher for Charlie. I put it down right after we got home because he was so out of sorts with us. She doesn't have a cat, but she said the other two scratchers that she gifted seemed to have been well received.